A politician always in the news because of his fiery rhetoric, Rana Sanaullah is the current minister for law and parliamentary affairs of Pakistan’s largest province, Punjab. He has a long credit history of struggle against dictatorship and is one of the close aides to the Sharif brothers. 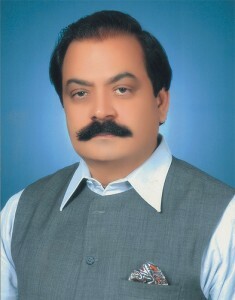 Biography: Son of Sher Muhammad Khan, Rana Sanaullah Khan was born on January 1, 1955 in Faisalabad, Punjab. He hails from a Rajput family. A practicing lawyer, he holds bachelors in commerce from Government College, Faisalabad and an LLB from Punjab Law College, Lahore. Career history: After education, Sanaullah began his political career from his native town of Faisalabad. Initially, he entered Pakistan Peoples Party (PPP) later joining Pakistan Muslim League-Nawaz (PML-N). He has been an elected member of the Punjab assembly four times since 1990 and has served as the deputy opposition leader and minister for law and parliamentary affairs. Sanaullah, during his career, has been put behind bars many times for his strong stance against dictatorship; however he has always stood firm against all odds, never compromising on his principles. Sanaullah continues to play a constructive role in the politics of Punjab. Controversies: Time and again, he has been involved in controversies, often due to his intense oration. Apart from the war of words with the former governor Punjab; Salman Taseer, on June 14, 2011, Sanaullah termed Babar Awan as ‘Wajibul Qatal’ (liable to be killed) on account of corruption charges. This statement of his was condemned all over the country.